(CBS/AP) LONDON - Britain's Prime Minister David Cameron returned from his vacation in Italy on Tuesday morning to try and take control of the violent riots which have escalated in Tottenham for three nights and spread Monday night to other large cities across England. Cameron emerged from a crisis meeting to announce that all of Britain's lawmakers were being recalled from their summer vacations to address the crisis. He also made it clear the strategy to stop the riots was to flood London's streets with police officers. Cameron said 16,000 officers would be on duty across the sprawling capital city of London by Tuesday evening. This is a stark contrast to the 6,000 officers that were overwhelmed by groups of rampaging youths in some areas the night before. He repeated a plea made by other officials in the previous 12 hours for parents to keep their children at home and out of trouble. Officials decided not to immediately implement some harsher measures which have been mentioned as options to control the spiraling violence, such as the use of water cannons or deploying military forces in London. Troops haven't patrolled the streets of London since 1919, when the Metropolitan Police went on strike. Deputy Assistant Commissioner Stephen Kavanagh said that the use of plastic bullets, which have never been used before during British disturbances are also being considered to quell the unrest. Some 525 people had been arrested in the riots and Cameron said that Londoners should "expect to see many more arrests in the days to come" as suspects are tracked down. The riots appear to have little unifying cause. Some individuals involved claimed to oppose sharp government spending cuts, which will slash welfare payments and cut tens of thousands of public sector jobs through 2015. But many people appeared to be attracted to the opportunity for violence. "Come join the fun!" 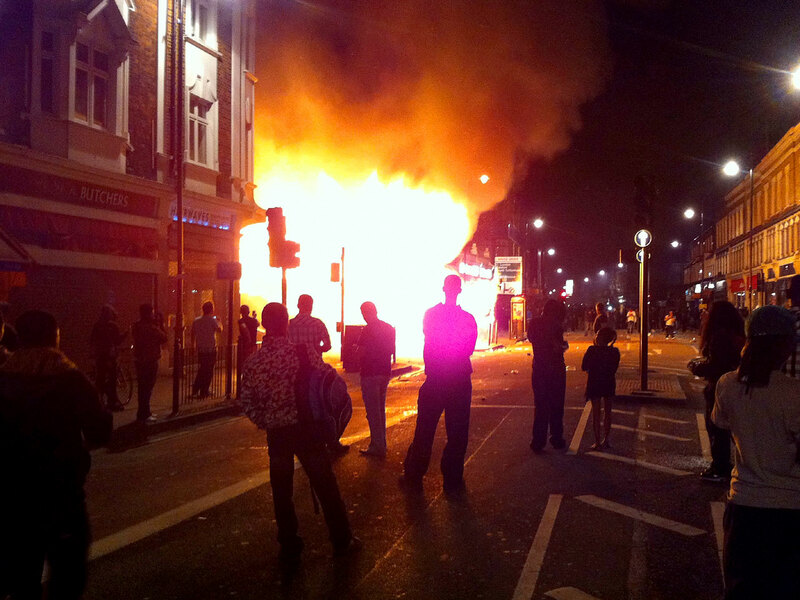 shouted one youth in the east London suburb of Hackney, where shops were attacked and cars torched. Violence first broke out late Saturday in the low-income, multiethnic district of Tottenham in north London. This is where outraged protesters demonstrated against the fatal police shooting of Mark Duggan, a 29-year-old father of four who was gunned down in disputed circumstances Thursday. A brief inquest hearing into Duggan's death will take place on Tuesday, although it will likely be several months before there is a full hearing.